I found a very nice puzzle from a old book written in Spanish. 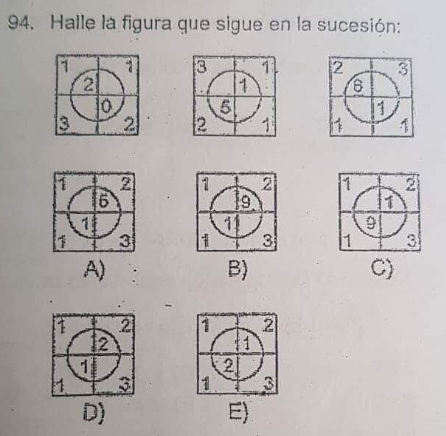 I got stuck after a few hours, the only possible solution I found was that the numbers inside the circle have a kind of succession. For instance: We have 20 in the first circle, then 15 and 16. So, I thought that 20 and 16 are divisors of 4, and the number is decreasing from 20 to 16. For this reason, I can think that for 15, the next value is gonna be 12. In conclusion, the letter B (Not E because the first number start from the square of number 1). But I don't think that my solution could be true. Do you have any ideas or hints to solve this puzzle? Or maybe you think that my solution was correct? Hence, following the pattern, the next number should be 16 + 2 * 3 - 1 * 1 = 21. Following the same clockwise rotation of the center number results in option E.
The largest number in the circle is always on the left half of the circle and adding all the numbers in the bottom-left square yields an odd number. Can a cube have a positive and negative on each face with no crossover?